The graphic design has been done-for-you. You just need to add your text and you can create professional-looking eCovers in minutes. Both sets of eCover templates will meet the standard sizes offered by eCover Authority. Use the flat cover with eCover Authority to create your final design. You receive 7 editable layouts for the spiral binders and 7 editable layouts for the thin paperbacks. 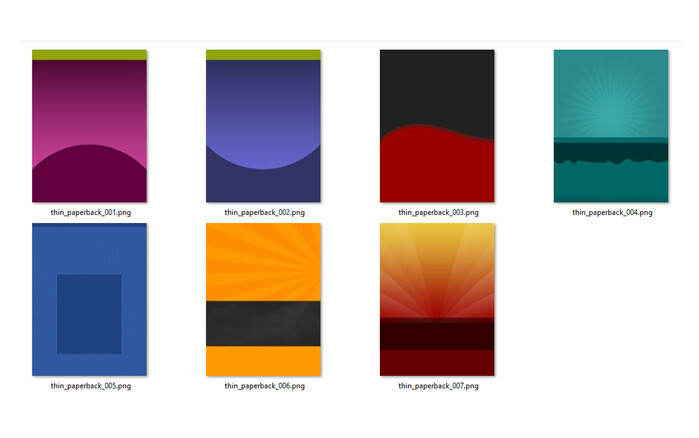 If you prefer different colors, simply open the PSD file and change them to suit your taste. You get 14 editable cover designs, which will supply an unlimited amount of attractive-looking covers, after you rearrange the template colors.